Okay, let me just get this out of the way. AHHHHH HOLY CRAP THIS RAT WEIGHS NINE POUNDS! There, I feel better, but residents of the Florida Keys don't. Why? Because these 9-pound Gambian giant pouch rats are on the loose. Here's how this debacle happened. 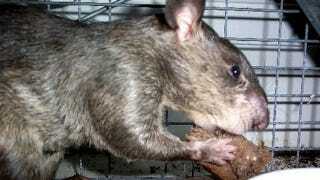 Some yahoo on Grassy Key island was breeding and raising these Gambian giant pouch rats. Like ya do. Sometime between 1999 and 2001, said yahoo released them into the wild, either on purpose or by accident, because that's what yahoos do. Florida State Fish and Wildlife Conservation Commission and U.S. Department of Agriculture officials thought they'd caught them all. Nope. It turns out they missed a few, and they've been breeding and spreading.